HouseBoat is a 15 minute drive to Coronado island and the convention center is only 3.6 miles away. 55-ft Houseboat recently renovated absolutely stunning! Houseboat is on the closest dock to shoreline for unobstructed views of San Diego bay and downtown San Diego. At high tide, the views are Breathtaking! Boat sleeps 4, Master bedroom has king size pillow top bed, living room has queen size sleeper sofa and two 48 inch TVs for viewing your favorite sporting event or movie. The living room has a reclining massage chair for a total relaxing experience. The master bedroom is also equipped with a 48 inch flat screen television. There is remote-controlled lighting in bedroom. All lighting is dimmable on entire boat. Stereo system is bluetooth. The spiral stairs to top deck are made from the finest walnut. Shower is 48" by 48". The top deck bar is granite with built-in sink. The top deck is set up with a very Robust gas grill with a built in rotisserie and burner for your cooking needs. 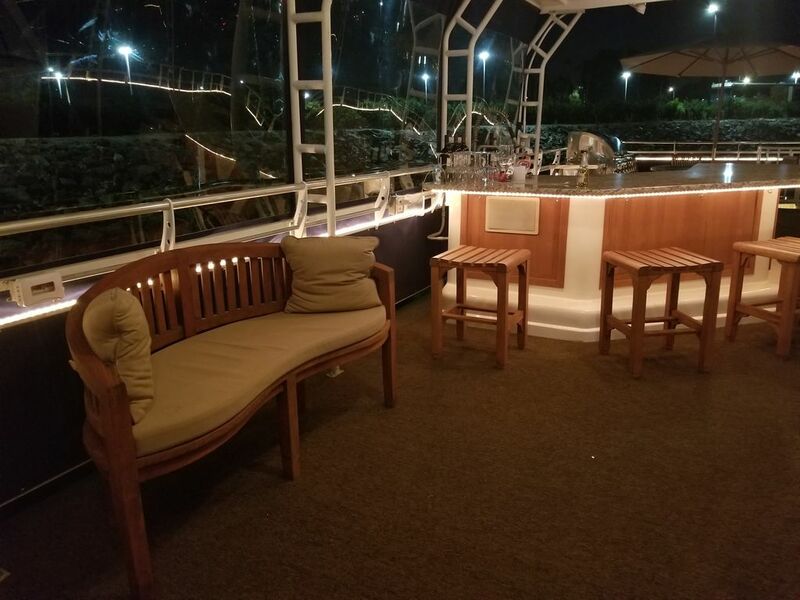 All 24 pieces of outdoor furniture on boat is made from the finest Teak wood for an absolutely stunning look,and very comfortable for a relaxing stay . I hope you get a chance to experience our home on the water and come back for many years to come. I have lived in San Diego for 20 years I enjoy outdoor activities.i like going to the imperial sand dunes (Glamis) relaxing on the water or just chilling my girlfriend . if you want to explore San Diego and be in the heart of it all then this is the right place ! this boat has all of the bell's and whistles. big closet for a large variety of clothes. three 48 inch big screen tv'., large outdoor grill on top deck with built in rotisserie. 1 and 1/2 bathrooms ,large bar on top deck for friends or family events. Beautiful lounging on forward lower deck and lower aft deck,or the beautiful 6 person dining area on top deck, and if you just feel like chilling at the bar on top deck it has 6 teak bar stools to accommadate your on entire boat is dimmable to set the mood,large shower for relaxing showers, Bluetooth stereo so you can play your favorite music from your own cell phone, desk in bedroom for people who have work to do while your on your size pillow top mattress for the best night's stay .Beautiful bar down stairs in living room for guest when it's chilly outside , air conditioning, and heat,very relaxing reclining massage chair and outdoor shower. 2 sets of spiral stairs to get from lower to upper deck. toilet, shower, Very large and exquisite shower off the master bedroom! Luxury club linens and white clean crisp bedding. We opted for the houseboat for space, comfort, and a unique experience and it didn't disappoint! The pride of ownership is truly special and Lisa even referred to it as our "home". We felt completely safe and comfortable as if we were at home. We've stayed on a moving houseboat before (this one is clearly docked) so we knew what to expect in terms of toilets and smells, but that's not a reflection of this gem. I'm a stickler for cleanliness and the owners request no shoes inside, which is nice. Part of check-out includes washing your dishes but the previous guests did not do a good job so we had to re-wash, the bar counter on the top deck had some gunk/dried ketchup on it, and when I wiped up the main bathroom floor the rag came out fairly dirty so normally I'd take a star off my rating but 4 stars would not be reflective of the many special touches this boat offers and the amazing time we had staying there. It definitely deserves 5 stars and we'll definitely be repeat guests! We thoroughly enjoyed our stay on Ben’s boat! Fancy n’ fun! Lisa met us at the boat, showed us all the boat’s amenities, and made sure all our questions were answered! Nice marina in a city of endless things to see and do! This was a beautiful houseboat with everything we could possibly need. Floating on the water was waaaaay better than any hotel we could have stayed in. The new soundsystem on the boat was great. Lisa and Ben were very helpful in introducing us to the boat and all the amenities. The bed was very comfortable. Super easy check in and check out. Would definitely recommend highly. We really enjoyed ourselves. Unique location. The boat is clean & well appointed. The master suite was perfect. The 2nd bathroom is a 1/2 bath & the sofa is a queen foldout. We could walk to many great places. Owners very helpful with information about the area & when the boat needed something. Highly Recommended! We do a lot of rentals, but never a houseboat! Thought it might be a fun new adventure... it was! The houseboat was beautifully furnished, well kept and very comfortable. Loved the location and surrounding marina atmosphere, too! Our hosts were delightful and attentive to our needs, Made us feel welcome and at home. Great rental, can’t wait to go back! Thank you Lisa and Ben for a very comfortable, clean, nicely decorated boat. We were so centrally located to just about everything in San Diego. I especially loved the high-end sheets and towels. The king size bed was very comfortable. Lisa, your boat "101" was perfect. We enjoyed our stay. very close to the airport, paddleboarding, fishing, clubs, shopping,nature, wildlife, uss midway museum one of the longest serving aircraft carrier s in the US fleet.star of inda built in 1863 in the Isle of Man a full rigged iron windjammer ship ,A must see ! gaslamp district with lots of bars,gift shops and .much much more .